1 8:37 Felt fast. Nice tail wind though. I think at some point I had a coupon to sign up for this race and that is what drove me to sign up for another half marathon that I really didn't need to do. But what can I say? I am a race junky and anything to get me out of the house on Saturday morning is well spent in my book. Plus, the race is held just minutes from my house. 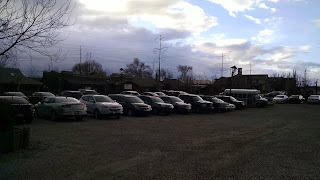 Like many of OnHillEvents races, they are held at Gardner village. The village is a set of small shops that sell knick-knacks and gift items and it also borders the Jordan River Bike Trail, which is where the race starts. I train on the north side of the trail and I rarely venture down to the south side. 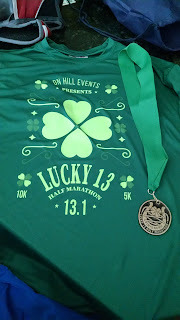 So I could've easily run this course on my own without paying a dime, but there is something about getting a support run, with a time, and a nifty t-shirt and medal. They had been predicting dire forecasts all week for Saturday morning. 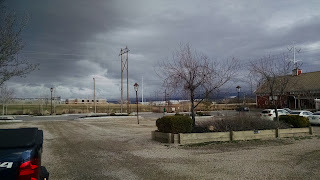 They were saying it was going to be gale force winds and rain. I had thoughts of going into the race on Saturday and backing down to the 10K or even the 5K. 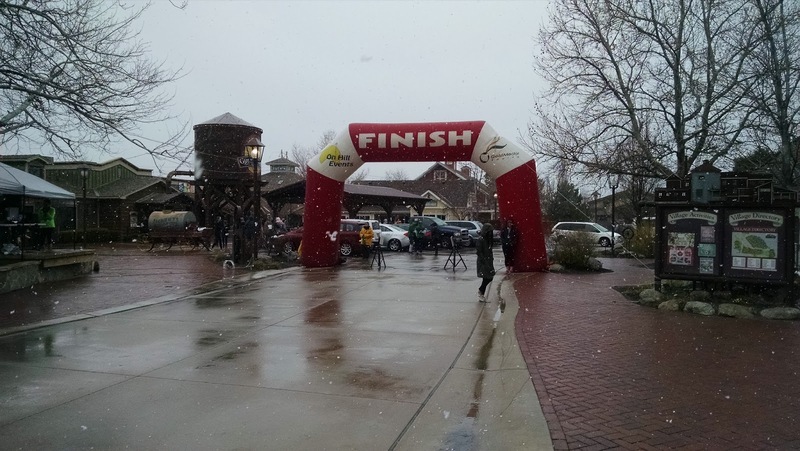 But over the years, I've suffered through many races and inclement weather, while never fun, doesn't really scare me. 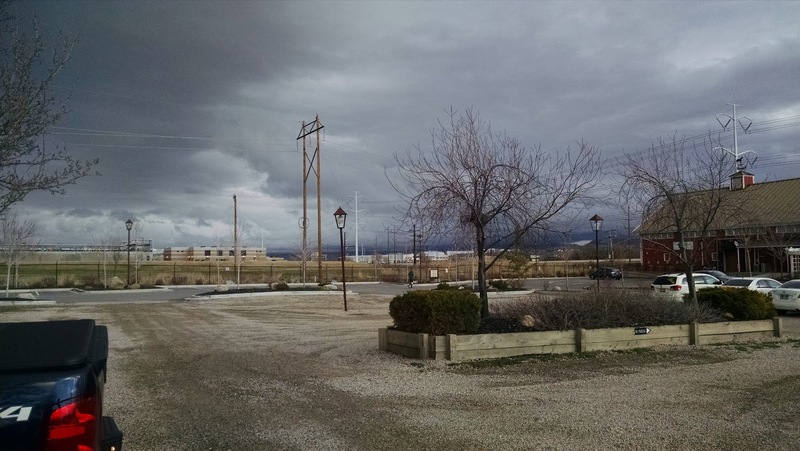 Race morning showed skies threatening rain and the hurricane force winds were mild at best. I opted to wear some throw away gloves, two short-sleeved shirts, and shorts. I was 100% fine, except my hands did get cold on the way back. I had picked up my bib the day before, so I rolled in 30 minutes before the race. I could've shown up 15, but I figured it would give me a few extra minutes to use the bathroom. 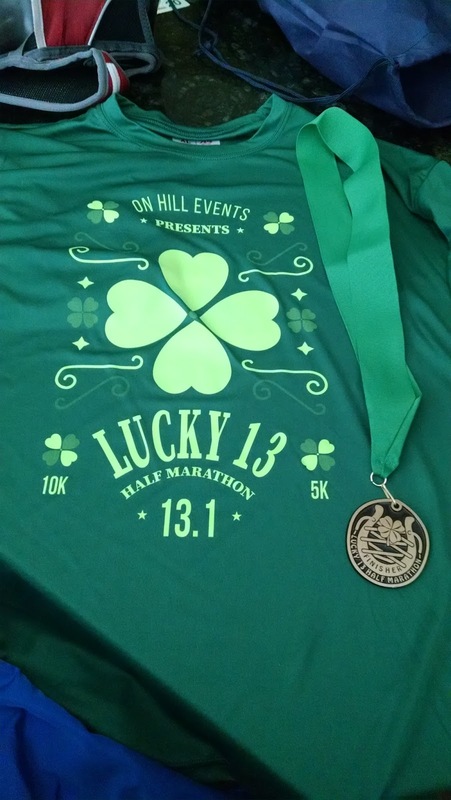 They had a 5K, 10K and half marathon race and as ubiquitous as St Patrick's Day Races are, OnHillEvents had a pretty good turnout. The race started at 9 AM sharp and off we went. I didn't think there was much of a tailwind at the start. I was wondering if I was going to get burned on the way back and I was constantly checking the trees and brush to see if they were swaying in the wind. But it seemed fairly stable. My legs have been shot most of the week. 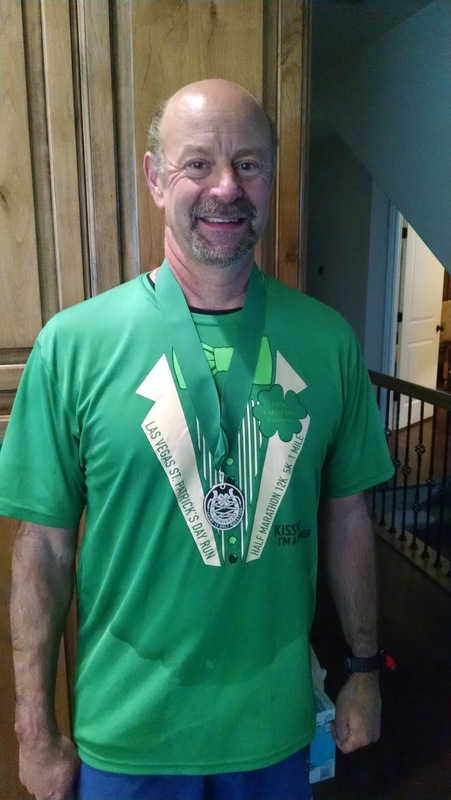 I've been running about 30 miles a week -- plus racing a half marathon nearly every weekend. So I wasn't feeling terribly fresh. I wound up going out a little too fast though. The 2-hour pacer was also going way too fast (at least initially) but despite an easy lope, the first mile went by in 8:30. Would I pay for that aggressive pace later? The race is held on the Jordan River Bike Trail. It is a paved and very flat trail. Occasionally we'd pass other runners, cyclists, or dog walkers. It is a nice bike trail, but as far as scenery went, it wasn't exactly jaw dropping. I cruised through the first 5K feeling pretty good but I felt like I was going too fast -- especially given my current "tiredness". I tried to dial it back and managed to do so a little. 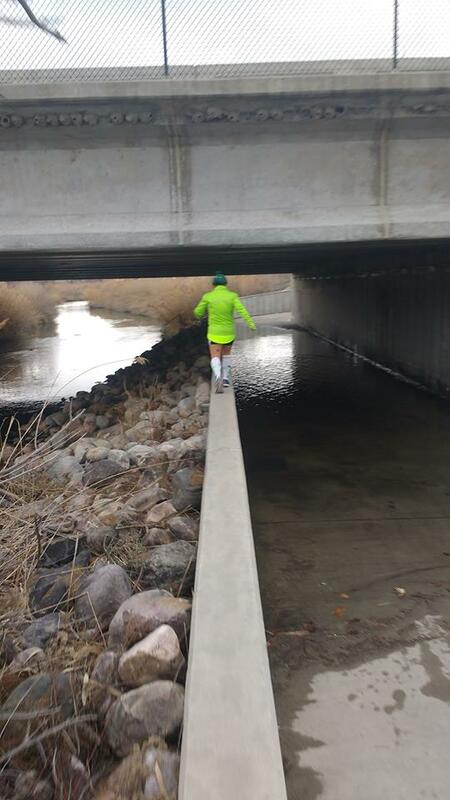 Around mile 5 we had to cross under a traffic bridge. As you can see from the photo above, it was flooded, maybe about 3- 4 inches of water. If it had been 70 or 80 degrees I would've plowed through it. Instead, however, most people were using the retaining wall as a balancing beam to get over it. My balance is terrible and to be honest, I was grateful for a "walk break". I had two people behind me and I was constantly apologizing as I navigated my way across. As soon as I got past the water I jumped down. However, I totally misjudged the distance and I did a spectacular somersault on the pavement. I think I fell on my side and I felt like someone had stuck a knife into my ribs. My hips hurt as well, but not nearly as much as my ribs. I took a deep breath and was like, "ouch". A few people asked if I was okay, which I said, yes and I tentatively continued on. I think the injury took a little more out of my confidence and it definitely hindered my pace. The turn-around seemed to be placed a little short and just as soon as I saw it a woman running the other direction said, "watch out for the wind". Darn it! I turned around and suddenly I felt the wind. We were in the open at this point and while it wasn't a gale force wind, it definitely slowed me up. I dug deep and despite the head wind, I managed to maintain a fairly decent pace. By the time I made it back to the water crossing (it was an out-and-back course) my rib was hurting me. It would come and go throughout the race but it was rearing its ugly head again. The racers had really thinned out at this point, so I could take my time crossing the hazard and I managed to cross the whole thing. The final 3 miles were a grind. I was gassed, my rib kind of hurt, and the wind just seemed to be enough of a presence to make life difficult. To top it off, it start to snow. There wasn't any accumulation but my hands were frozen and my skin was turning a bright red. I was passed by two female runners in the final 3 miles but other than that, I was running solo. I'd turn around and look behind me, but there wasn't another runner in site. I was just so relieved just to be done and I came in with a fairly respectable time despite having to walk through the water hazard, which probably cost me a minute. I am reasonably happy with my time. I knew beforehand it wasn't going to be a stellar race. I am just too fatigued and over trained right now to run a PR worthy time. Still, I had fun despite bruising a rib. The course wasn't anything special. I've run it before and I could run it every day if I ever decided to run south. It was quite simply an affordable race and I got a new t-shirt and finisher's medal. Alas, I figured I'd be a shoe-in for an age group award, but the 45 - 49 age division was stacked. 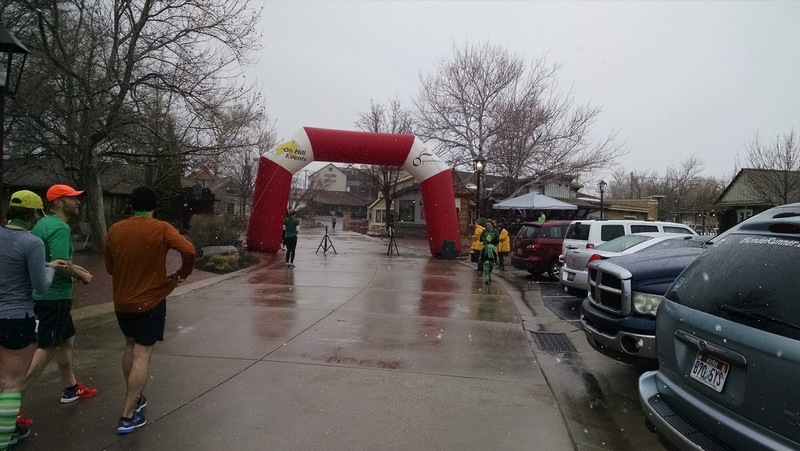 When I was running I saw the runners coming back on the out-and-back course I figured I'd be lucky to place. The course was well marked -- there was only spot I was a little confused on where to go, but he had the major intersections crewed by friendly volunteers. There were several aid stations as well and appropriately marked intervals. 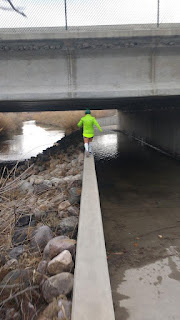 I do suspect the course was a little short but there were some stretches where I ran under bridges which might've affected my GPS. Post race food was typical: sports drink, oranges, bananas, peanut butter sandwiches, and Fat Boy Ice Cream Sandwiches. I was too cold to eat much, but I grabbed a banana, spent some time socializing and once I figured out that I wasn't in contention for an age group award, I took off. Overall, it was a nice race and I am glad I did it. I am still suffering from a bruised rib which makes coughing, sneezing, and even sleeping painful. However, I will be fine. It isn't cracked and it is certainly one for the story telling of my running adventures. Performance-wise, I'd give myself an okay grade. I didn't run stellar but it also wasn't a major disappointment, especially given the circumstances.